Aim and Background: Azoles as antifungal drugs have been used to treat leishmaniasis for many years. Several evidences suggesting that the primary target of azoles is the heme protein, which co-catalyzes cytochrome P-450-dependent 14α-demethylation of lanosterol. Little is known about the structural changes caused by azoles with atomic force microscopy (AFM) or scanning electron microscopy (SEM). In the current work, several patented antileishmanial agents reviewed (US8809555) (US 0269803 A1) (TW201802093 A). 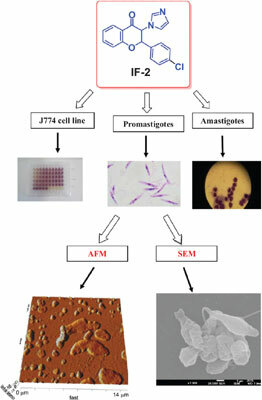 The present study aimed to determine ultrastructural damage in Leishmania major (L.major) induced by the newly synthesized azole. Methods: In this study, we investigated the morphological alterations of the parasite treated with our new synthesized azole namely trans-2-(4-chlorophenyl)-2,3-dihydro-3-(1Himidazol- 1-yl)-4H-1-benzopyran-4-one (IF-2) against L.major promastigotes stage using two high-resolution microscopic techniques: atomic force microscopy and scanning electron microscopy. Results: The results showed remarkable topographical and morphological alterations in the cell membrane at promastigote stage of L. major treated with the potent investigated azole (IF-2) ( IC50 values ≤8.9 µg/mL). Both techniques revealed membrane damage and also losing the flagellum in the observed cells. Conclusion: Our results strongly confirm the Leishmania cell wall as a potent target for the new synthesized azole (IF-2). Accordingly, focus on membrane integrity and glycoconjugates of Leishmania parasite to design new therapeutic agents is recommended. Leishmania major, Synthetic azole, AFM, SEM, membrane, glycoconjugates.